The marketer of products such as Snuggies and Magic Mesh door covers must pay $8 million to settle charges of deceiving consumers. 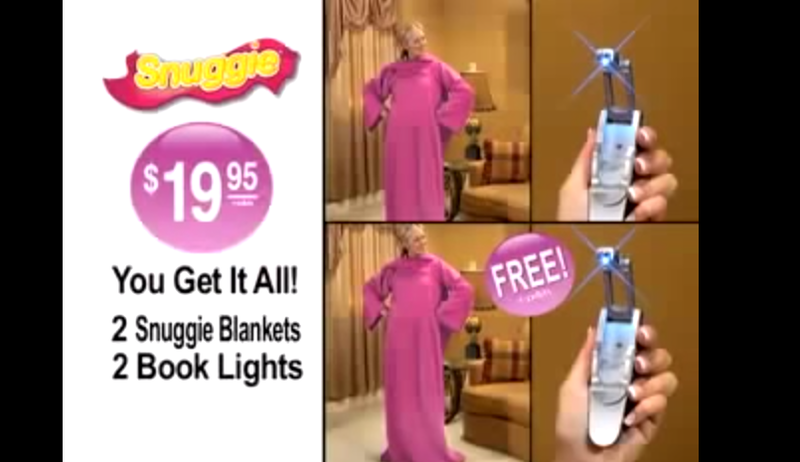 The marketer of popular “as-seen-on-TV” products such as Snuggies, Magic Mesh door covers and Perfect Brownie Pans must pay $8 million to resolve federal and state charges it deceived consumers with promises of buy-one-get-one-free promotions and then charged exorbitant fees for processing and handling, nearly doubling the cost of the products. The Federal Trade Commission announced Thursday that Allstar Marketing Group, LLC, agreed to pay $7.5 million to the agency for restitution to consumers and $500,000 to the New York Attorney General’s Office for allegedly deceiving consumers about the cost of its products marketed through commercials. According to the FTC complaint [PDF], since at least 1999, New York-based Allstar deceived consumers by failing to disclose additional fees associated with its frequent buy-one-get-one-free offers used to sell products such as Cat’s Meow, Roto Punch, Perfect Tortilla, Forever Comfy. However, the FTC complaint alleges that the narrator never discloses that Allstar charges $7.95 in “processing and handling” fees for each Magic Mesh purchased. Additionally, it is never disclosed that consumers can not decline the second free Magic Mesh curtain, meaning that the minimum processing and handling fee charged is actually $15.90, according to the complaint. When the purchase is calculated after the fees are added, the price of the product jumps to $35.85, nearly double the advertised price. In addition to deceptive commercials, the FTC claims that Allstar further deceived consumers when they initiated a purchase either by phone or online. Consumers who called Allstar were often immediately instructed to enter their personal and billing information and subsequently charged for at least one set of products, before they were able to indicate how many products they wanted. The FTC says that because the company’s sales pitch was often confusing, many consumers purchased more sets of the product than they actually wanted. Once the initial sale was recorded, Allstar then attempted to upsell additional goods or services. “As with Defendant’s main offer, the ordering process for the various upsell offers is deceptive and misleading, and the total cost associated with the upsells is not disclosed during the telephone call,” the complaint states. For example, when ordering the Magic Mesh, consumers are promoted to use a keypad or say the number of “additional buy-one-get-one-free” sets, however, the cost of these products are never disclosed. There is no way for consumers to bypass this part of the ordering process, the FTC states. In many instances, after the consumer completes the initial upsell portion of the call, they are transferred to a third-party for additional offers not related to Allstar’s products, which include discount shopping clubs and “free” Bahamas cruise. According to the FTC complaint, at no point during the ordering process are consumers made aware of how many products they ordered or the total cost of their purchase. The company does not give consumers ordering over the phone a chance to confirm or edit their purchases. Consumers who made purchases online faced similarly deceptive and misleading processes. The company only discloses the additional fees in fine print near the bottom of the ordering page. As with the telephone orders, once consumers indicate the number of products they want to order and input their payment information, they are directed to a series of upsell offers. The FTC says that many consumers either do not see the alert or do not understand that it means they have already placed an order by submitting their billing information on the previous page. As a result, many consumers once again select the number of “sets” they would like to purchase as part of the main offer, which results in Allstar at least doubling consumers’ orders. Unlike the telephone orders, consumers do see a subtotal of their purchase online, however, they are unable to make any edits or cancel the transaction. The FTC says that even if consumers were able to cancel their transaction, Allstar makes it nearly impossible to receive a full refund for products. Although the company touts a “30-day money-back guarantee (less p&h), consumers have reported the company refused to issue refunds and directed consumer to return the unwanted products at their own expense. According to the complaint, the FTC charges Allstar with two violations of the FTC Act, which prohibits unfair and deceptive acts or practice in or affecting commerce, and three violations of the Telemarketing Sales Rule, which prohibits abusive and deceptive telemarketing acts or practices. • During telemarketing, illegally billing consumers without first getting their consent. In addition to providing $7.5 million for consumer refunds, the proposed settlement prohibits Allstar from failing to obtain consumers’ written consent before billing them for any product or service. The company must also clearly and conspicuously disclose – before billing consumers – the total number of products they have ordered, all related fees and costs, and material conditions related to the products purchased. In a separate, but related consent order, the New York Attorney General Eric Schneiderman announced today that Allstar must pay $500,000 to the office for penalties, costs, and fees to settle charges of misleading and deceiving consumers. Consumers who believe they may be entitled to a refund should notify the Attorney General’s office. Consumers can file a complaint online or obtain a complaint form at http://www.ag.ny.gov.